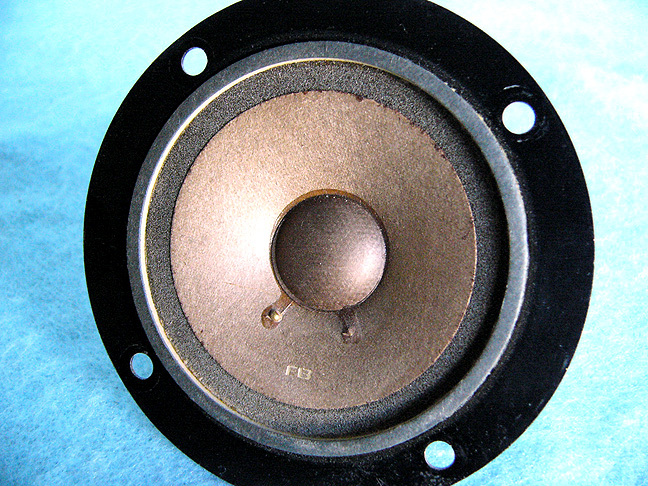 Pioneer utilized foam surrounds on the tweeters of these 4 of the 1970's 'CS' models. After 20+ years, it will be difficult to find a pair that still has the foam intact (as foam surrounds generally have a useable lifespan of 10-15 years, depending on the environment they have spent the majority of their lives in). Almost 100% of the models we have seen have their tweeter foam rotted (it might look ok, but if you 'poke' it with your finger, it will crack or crumble, thus it was bad before you poked it). We have only found one suitable "fix" for this and have searched high and low for a 4 Ohm replacement for the CS-99A, a 16 Ohm replacement for the CS-88a, or even a suitable 8 Ohm for the CS-77a, with no success. IT WILL NEED TO BE TRIMMED SLIGHTLY ON THE OUTSIDE, BUT WORKS WELL. (This applies only to vintage Pioneer models CS-99, CS-88a, CS-77a & CS-66G tweeters). The tweeter just to the left is from the CS-77a. Looks good, but surround is rotted. A visibly fine surround, is still bad and will visibly deteriorate after a few songs are played on them. We see these at on-line auctions often, and in every case the speakers either still have their rotted originals or a replacement tweeter, of some-sort installed. Due to the rarity of 4 & 16 ohm tweeters, and poorly fitting '8 Ohm' tweeters out there, we have to assume that the replacement tweeters the owners / sellers have installed are of incorrect impedance, which at the least, effects high-end efficiency (volume) & at worst can create load issues for whatever amplifier they are connected to. All this while using the word "Mint" or some similar adjective to list / describe the speakers. Again this is only prevalent in CS-77a, CS-88a and CS-99. It is not a factor with CS-77, CS-88, CS-99a, CS-33a, CS-66a or CS-901a's. PS. We also see a similar problem with many other manufacturers' older speakers generally from 15+ years ago, except for the earliest versions of speakers which commonly used cloth surrounds. Any manufacturers' speaker utilizing foam surrounds (common from typically 1980 thru present) that is over 10 years old should be suspect. PSS. Even though a speakers foam surrounds may "look" fine, they probably are not! Vintage speakers posted for sale by individuals & at auctions / yard sales have commonly not been in use for many years (other wise they probably wouldn't be for sale). In many cases, once you start playing them more than a couple minutes, you can watch the foam disintegrate right before your eyes, just by playing 2 or 3 songs at above average volume levels. Just FYI while you're out looking.